For many, public transportation is a vital part of daily life. The San Francisco Municipal Railway (“Muni”) includes a range of transit options such as light rail, buses, and trolleys that transport users throughout the city and also connect to other services providing transportation throughout the Bay Area. As members of the Bay Area community, our team understands the importance of Muni to our residents and visitors, as well as to the health of our local economy. As a San Francisco Muni accident law firm, we also know how important it is to keep the transit system safe and we are committed to helping the victims of transit accidents throughout Northern California. Recent weeks have seen a rash of Muni accidents. On Monday, as detailed in the Oakland Tribune, this trend continued with a serious accident in the Civic Center station. 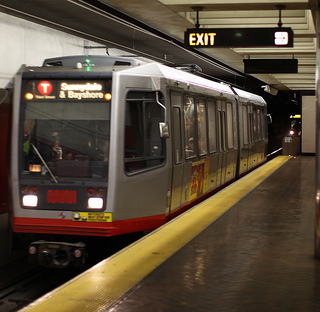 A man was struck by a Muni Railway train on the track located by the outbound platform at approximately 5:17 P.M. According to police, responders transported the man to San Francisco General Hospital for treatment of life-threatening injuries. One of several other Muni accidents that have hit the system in the past weeks occurred on June 12 and, per the Oakland Tribune’s report, sent fifteen people to area hospitals. The accident involved an F-Market and Wharves streetcar colliding with a 9L-San Bruno bus near Market and Sixth at approximately 11 A.M. The impact shook the bus and injured a number of riders, including seven children who were among those taken to area hospitals. As we have discussed in these pages before, there are some special rules governing lawsuits against Muni, such as the injury claims that might arise out of the recent Muni accidents. Injury claims against Muni must be filed within six months, not the two year period applicable to most personal injury claims in California. Victims must also file a specific claim form with the city and county. Neglecting this step can lead to a suit being dismissed for failing to comply with procedural requirements. These complex rules make hiring experienced counsel essential to success in a Muni suit. There are a number of factors that can contribute to a transit accident. Some Muni accidents are the result of driver error and can give rise to claims of negligence or recklessness. Other accidents occur because of equipment that is faulty or improperly maintained. Corporate decisions can also contribute to accidents, such as inadequate training or overcrowded tracks. Often, a number of different factors can contribute to a single accident. Understanding these factors requires experience and the ability to work with experts in the transit arena, skills that our California transit lawyer has developed in more than a decade and a half of legal service. Muni accidents can lead to a wide-range of injuries, from the simple to the catastrophic, and can also lead to death. In some cases, the victims are passengers or people waiting to use a Muni service. In others instances, the victims are bystanders, such pedestrians or bicyclists struck by a Muni vehicle. In still other cases, the victims are occupants of cars, trucks, or other motor vehicles involved in a collision with a Muni transit vehicle. All of these victims deserve the help of experienced legal counsel. Call to arrange a meeting with Attorney Brod to discuss your case and how our Muni law firm can put our experience to work for you.